Although the Santa Cruz Guerilla Drive-In has not had a regular summer schedule for awhile, we are still active. One engaged aspect of the project is to provide technical support to others that need support. So, we are joining with the Santa Cruz Forest Keepers for this event below. 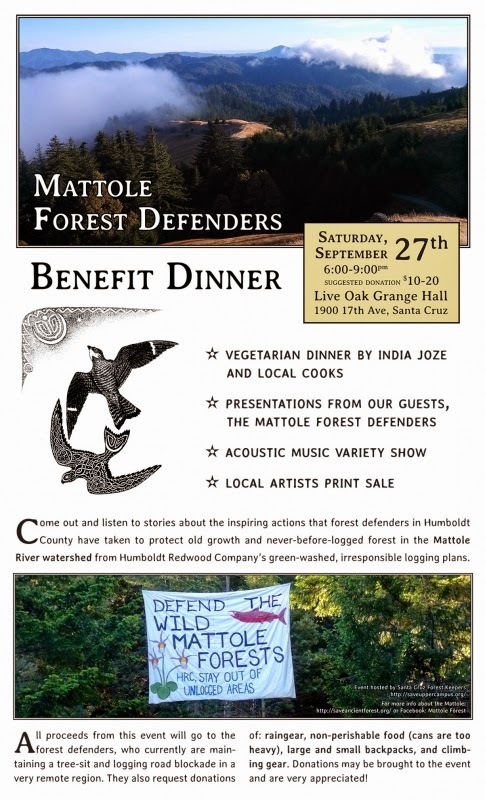 Come out and listen to stories about the inspiring actions that forest defenders in Humboldt County have taken to protect old growth and never-before-logged forest in the Mattole River watershed from Humboldt Redwood Company’s green-washed, "FSC Certified" logging plans. All proceeds from this event will go to the forest defenders, who currently are maintaining a logging road blockade and tree-sit in a very remote region. They also are requesting donations of: raingear, non-perishable food (cans are too heavy), large and small backpacks, and climbing gear. Donations may be brought to the event and are very appreciated!